In India, maybe elsewhere in the world as well, the two words settling down are quite frequently heard when one reaches the age of 20+. People often throw up the question When are you planning to settle down? The question actually means When are you getting married? But it is quite unsettling that the phrase settle down refers to getting married. An individual's whole life takes on a different turn when he/she gets married but that is referred to as settling down. And settling down is not the remotest phrase to refer to marriage. Well, . . . But I found that the phrase settle down does not refer to getting married alone. It could refer to getting a job after studies or getting children after marriage. But whatever those two words signify, settling down does not happen unless one feels that life is enough. Another issue that constantly niggles me is the question: Settling down after what? Does it signify settling down after boisterous youth which has been spent in wanton and frivolousness? If that is so, then it cannot be homogeneously used for every individual. But many people (even those in the "young" bracket) choose to ask the question almost as if it is something quite natural to ask. But contrary to what I have mentioned in the first line, the phrase sometimes is used while speaking to people who have just gotten their children married: Now you can peacefully settle down, as your children are married. In this case, does it mean that the only impediment to settling down was the marriage of the children? Well, not necessarily. But I reckon that the words settle down refers to a state of zero-worry and tension. It points out to the fact that marriage, children, a home and other things make sure that the individual is in a position where he/she can rest and sit back. Whatever said and done, I think that one cannot settle down in life as life requires us to be in action while also being restful and calm. So, marriage, secure job and other things are part of life and not something which causes an individual to settle down. Well, what do you have to say on settling down in life? dancing in the grocery store, singing full volume in the car. Having fun and not caring to much about protocols is how I want to continue living my life. Laughter 1st I say. I wish you never settle down. As always xoxoxox in abundance. Welcome here. How nice to have you here. All of us belong to the same school of thought, I reckon. Bravo. Come again when you find the time. Settling down = stagnancy and that is something i do not believe in. To the indian culture it means, marriage, parenthood, and so on. To me, settling down means having a plan for your life, and setting a routine that follows a certain course. It can mean that you are going to end up in a rut, but if you are flexible and able to change course if need be, it can be fruitful. Susan, I honestly tell you this... if I had to "settle down" for once and for all, I would positively lose it. What keeps life interesting is that we are unsettled, always moving, always changing, always new. Nothing wrong with being a bit still and settled, sometimes, but then... time to get up and do, once again! 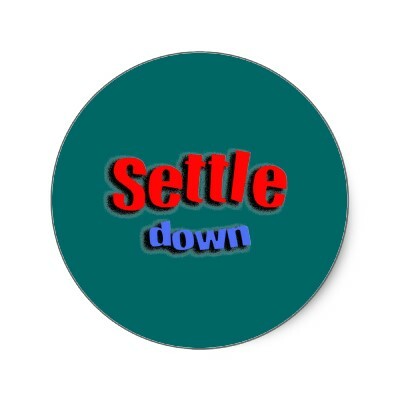 for me "settling down" has positive connotations. However, I have others in my life who are determined not to "settle down" and they keep me on my toes! For me settling down meant- deciding what you want to do for living, taking up a place, put up somewhere. Is there not a difference in being 'child-like'...or 'childish'? I hope to NEVER lose my 'child' attitude, inquisitiveness, zest and love for life and JOY over the little and BIG happenings! Life certanily has a tension to it. That tension is often considered bad and other time considered good. But regardless there is no escaping the tension. Good Post - once again. Hope you had got my mail at g-mail? I hear you when you say that too much planning can lead to life getting a bit boring. We should be ready and flexible for change. I'm glad that you are able to do what you want, Alpana. Nothing like that. Thanks for coming by dear Alpana. Ha Ha. Enjoyed reading your quirky comment :) Hope your Easter was grand. Glad, Steve. You are one rockstar! Tension, yes and passion, a bigger YES. Challenges . . . life is made of them no matter what. I did get your mail. But I just couldn't reply. So good to see your comment after long. Hope you have been well and that life is treating you well. Aha, just when I was about to ask my son "so when are you planning to settle down"
He is 28.....maybe some more years ? I don't know. As we say there is no fixed time or age for settling down. But on the flip side, maybe parents are worrid that by the time they retire, their children should be able to look after themselves. settle down? Never if I can help it! But I know what you are talking about. My mom is a major "settle down" matron. She feels life is not complete unless you marry someone even if after you do, your life is anything but settled. Please don't ask that to your son. Things will happen when they are ought to happen. But I do hear you as you are a doting father. Glad to see you here. It is always great when I read your comments as I haven't forgotten that you were my first foreign reader! Lots of love and big hugs, dear Jenean. Your thoughts always add to what I have written here. ""Settle down" matron" sounds so funny. I am imagining rmamma now. Most mothers are like that, I reckon. Yes, most of them even here fee that life is incomplete if one does not marry, find a job, get children and have a 'own' house. Sad. I wish I never become a "settle down matron" for anyone! The day I consider myself settled down will be the day I have all that I ever wanted - and that cannot happen atleast in this lifetime! Settling down can definitely refer to a comfort zone in the path of life. Nice to know your thoughts on this one. I would have been glad if your name was posted too. Anyway, thanks for your comments and time. Wow! Now that is something wonderful. What were you doing until that, if I may ask, dear one? I use the expression quite a lot when I'm out and about with my children and they misbehave. I even have different ways of emphasizing the words to express the seriousness of the situation. Would love to hear the different ways of emphasis! Thanks for linking me to this post. I figure you're right: it's a state of contentment, a stable state of sorts where there are no upheavals, no major changes, that people refer to when they say, "settle down". But it's probably only an illusion, because no one really "settles down" until one's end when you become a part of the earth again. We move from discontent to discontent, with temporary "settlements" of contentment in between.